I know I have my own few pet interests. No I'm not talking about my dog. I'm talking about the small handful of topics that I know in depth. Restated - there's only a few things that I feel I know enough about and am therefore comfortable writing about. And so we arrive at the image above. The question I feel this brings up is "Do you / Can you write about topics that catch reader interest?" Are you aware of your own topic strengths? Are you cognizant of reader's interests? Does your authorial expertise and reader interest intersect? I find this an interesting place to be. Self awareness*, in this case is a good thing. Writing a book, all the while under the presumption that what you write is going to sell, is a risk, maybe even the height of folly. It's like a new business. The owner of the business, presumably the person with the idea that has been brought to fruition in the form of that business, hopefully sat down and had a cold blooded, self-aware, rational discussion. "How come no one has done this before? ", "Is there a market? ", "Is the market large enough?" "Who is my target buyer?" "Who is my target customer?" I think writing a book could use this same discussion and pseudo risk analysis. It's different from being a good writer, in the many ways that can be defined. This is about whether or not there is a market, AS DEFINED by the drawing above. 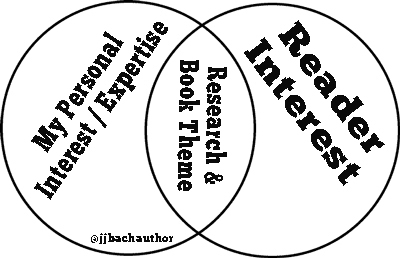 It's not only your expertise OR the reader's interests. It's about the intersection of the two. Has your topic been written about before? Can you find a target group of readers? Besides your relatives? Many times there is no answer. Do you have a notion of how you can create awareness and desire for your new book? There's no perfect answer here, that's why I threw in "risk analysis". Better to be aware of this line of thought and the resulting possibilities, than to jump in, write the book and watch it lay on the shelf unwanted, without EVER REALIZING this was a possible outcome. I think of, and greatly admire, JK Rowling sitting in some Brit café, sipping her hot tea, broke and almost penniless, as she wrote her set of world altering stories. She probably had no answers to any of those questions. She just wanted to write a good story about a topic she apparently knew well enough to write about. So she did and the world is better for it. On the other hand, I just read a LinkedIn group question from an author lamenting the lack of sales for their new book. Opposite ends of the same subject. At the end of the day, your book will never happen if you only dream about it. Writing remains the first critical step. Maybe though, there's a sliver of space for rational analysis of the Venn part of your expertise and reader interest?